Textile designers shift between digital and material worlds to find design inspiration. For further info go here. 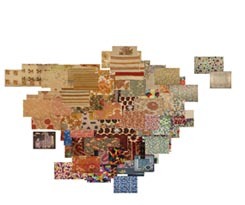 Yesterday we attended an event at the Royal College of Art (London, UK) that presented a very exciting new FREE textile design service: a downloadable archive of all of the Victoria and Albert Museum’s textile archive.